France can be appreciated for its city glamour and country charm. It’s a place where there is respect for both contemporary art and ancient cave paintings, for rustic baguettes and country cheese and for foie gras and champagne. If you’re lucky enough to have visited, you likely have memories of the food, landscapes, and fashions you encountered. And if you haven’t yet traveled to Paris, you’re probably itching to go. Kaari Meng’s new line of French General fabrics, Pom Pom de Paris, will delight Francophiles, whether or not they’ve been to The City of Lights. From sophisticated large-print toiles to cozy florals, the warm reds, pinks, and yellows evoke the country where lucky Kaari spends time each year. 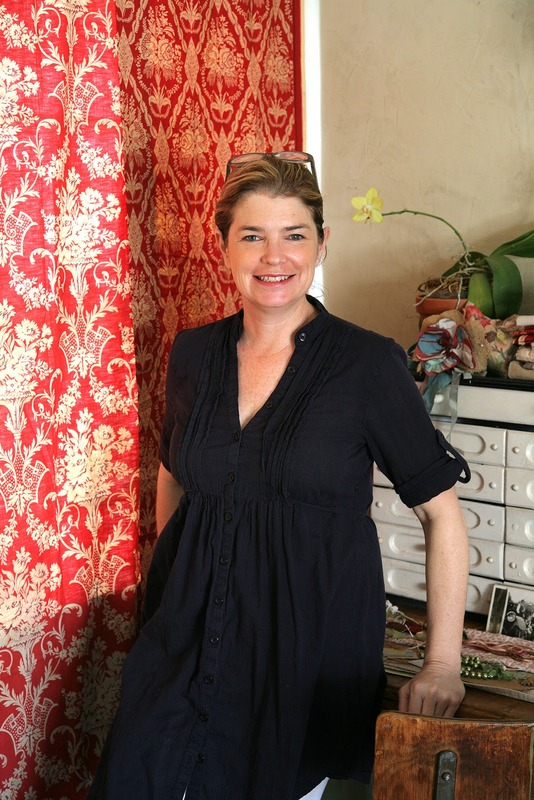 Her trips invigorate her fabric design (many French General fabrics are inspired by pre-1900s French textiles) and provide treasures for her Los Angeles shop, French General. Kaari started her career as a jeweler, creating necklaces and bracelets from the vintage glass pieces she’d scavenge from old warehouses in New York and Providence. Later, she and her sister had a shop in New York City where they sold beads and baubles in big apothecary jars, along with French ribbons and textiles. But the seven-days-a-week pace was draining and after five years she closed the shop and moved to California. There she opened French General, where she sells carefully collected linens, jewelry, home accessories, notions, and more. Kaari also is the author of five books, including Home Sewn in 2008. Her most recent, The French-Inspired Home, has just been released. Each summer Kaari and her husband John take daughter Sophia to France. They scour markets and visit vendors in search of new and vintage items for the shop. John’s family lives in France, where his father was a chef and his uncles are all in the food business, so dining is as important a part of the trip as sourcing shop goods. For the past three years Kaari’s also led a getaway to the south of France for textile and crafts-lovers. Unfortunately, the summer 2011 tours are already filled. But it’s good to know that even if we won’t be going to France this summer, we can still recreate a little of the look and feel of France with Pom Pom de Paris. Merci, Kaari! I just love all the French General fabrics that have come out. So warm and romantic. Thanks for sharing about Kaari. Bonjour! Oh I so agree with your first comments about France, but maybe I am biased because I now live in France Yay, how lucky am I. We moved here from the UK 7 years ago. I love all French General fabrics, especially Pom pom de Paris.